Here you can view the answer sheet of CBSE class 10 English (Communicative) topper 2018 that has been published by CBSE for class 10 students. Students can use this topper’s answer sheet to plan their way for writing the board exam perfectly. CBSE’s has released the toppers’ answer sheets for CBSE Class 10 Board Exam 2018, to showcase the strategy followed by the toppers in attempting the paper correctly to secure full marks. Class 10 students, to get help in their board exam preparations, can view the answer sheet of CBSE class 10 English (Communicative) topper 2018, here in this article. 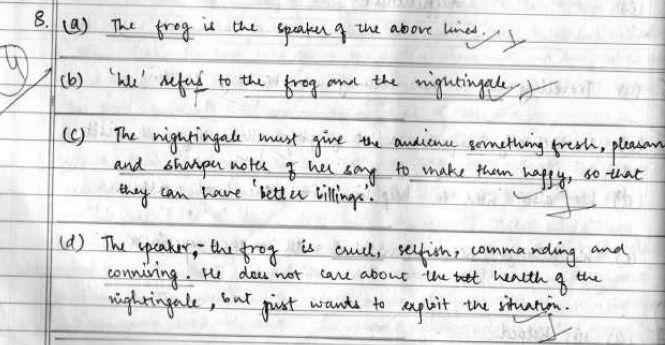 CBSE has published the scanned copy of handwritten answer script of the class 10 English (Communicative) topper of CBSE class 10 board exam 2018. Students can use this topper’s answer sheet to plan their way for writing the board exam perfectly. Students may download the answer sheet of highest scorer in class 10 English (Communicative) exam 2018. (b) Who does ‘we’ refer to? (c) What must be done for ‘better billings’? (d) What trait of the speaker’s character is revealed through the above lines? What are the main points to be taken from the CBSE toppers’ answer sheets? Going through the topper’s answer sheet is an excellent practice and would certainly help you improve your presentation skills.